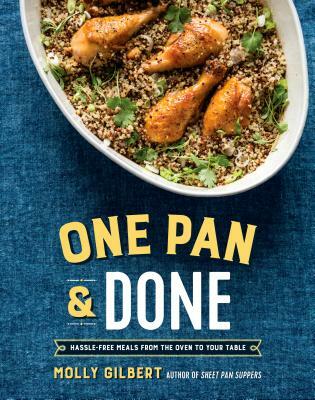 The author of the runaway hit Sheet Pan Suppers expands her repertoire with easy and delicious recipes for dutch ovens, skillets, casserole baking dishes, and more. In One Pan & Done, Molly Gilbert shows you how to use your oven to your advantage, letting it do most of the work to turn out juicy, crispy roasts, succulent vegetables, rich stews, flaky fish, and, of course, sweet treats. Think of it as fast slow-cooking, but with the benefits of baking, roasting, and broiling for concentrated, intense flavor every time. The best part is that with Molly’s simple, hands-off recipes, you’ll have time to savor your meal and enjoy your company. Whether you’re an over-scheduled parent, a busy young professional, or even an accomplished cook, you deserve food that’s big on flavor, but simple on steps. With Molly’s recipes, you get in the kitchen, and you get out. Kick the oven door shut as you walk away—your meal is One Pan & Done. Molly Gilbert, a graduate of the French Culinary Institute, is the author of Sheet Pan Suppers, a food blogger (dunkandcrumble.com), former cooking instructor and private chef, and former recipe tester in the kitchen of Saveur. She lives in Seattle with her husband and son.